Tip: Quality turf is usually 2-3 inches tall. 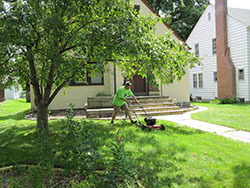 Shorter grass invites pests and weeds and lets more polluted stormwater run off the lawn. (Learn more about this clean water tip). MCWD will not be accepting applications for cost share grants at this time. We are reviewing opportunities to align our grant program with our strategic priorities and ensure MCWD funds are put to their highest and best use. We are continuing to support the Master Water Stewards program and capstone projects, honor commitments made to applicants who have been approved for funding, and offer resources and trainings for individuals interested in learning more about clean water practices. Click here for the latest education offerings. For information on other grant programs that fund natural resource improvements, contact your local municipality. You can also visit Hennepin County's website or Carver County's website and enter "cost share" in the search bar. Hennepin County also offers environmental education grants. For more information on that program, visit Hennepin County's website and enter "green partners" in the search bar. Thank you for your interest in protecting and improving clean water! We all own waterfront property! Even if you aren't living on a lake, stream or wetland, what you do on your property affects the health of nearby bodies of water. In most urban and suburban areas, your street connects to downstream lakes, wetlands and streams through the storm sewer system. Water runs off your street and yard into storm sewers, collecting pollutants along the way, and eventually makes it into our lakes and streams. How can you help to protect and improve clean water? Check out the articles in this section on rain gardens, rain barrels, native plants, green roofs, and more. Stormwater is usually viewed as a burden to be managed but it also can be a great resource. The pollutants found in stormwater -- phosphorus and nitrogen -- are the same chemicals that grass, plants and trees need to thrive. Using stormwater instead of drinking water for watering the lawn, putting out fires, and other tasks conserves resources and reduces the amount of polluted stormwater that enters our lakes, rivers and streams. Rain barrels are an easy way to collect and use rainwater for your yard and landscape plants. They range in size from 50 gallons to 130 gallons. In addition, a rain garden can be paired with a rain barrel for water overflow. You can build your own rain barrel or buy a pre-made one. An easy pour spout allows you to connect a hose or fill a watering can. It is important to ensure that the water is closed off to bugs and debris. A carpet of green grass is a satisfying feat, but can require the use of fertilizers, watering and pesticides. How you take care of your lawn is important for clean waters. When fertilizer is spilled or washed into the street and down storm drains, it can harm our lakes, wetlands and streams. The same is true for lawn clippings, fallen leaves and pesticides. When these materials wash into our waterways, they bring with them excess nutrients and pollutants that can cause algae or other damage. A little salt goes a long way for managing snow and ice. But too much salt – which may be less than you think – can cause irreversible damage to nearby lakes and streams. The danger of ice and snow on roads and sidewalks is a fact of life in Minnesota, and salt and sand can help reduce ice and add traction. When that snow inevitably melts, however, most of that salt and sand wash directly into nearby waters. Currently, salt use is not regulated, but it poses a real threat to clean water. The chloride contained in one teaspoon of road salt can permanently pollute five gallons of water. Chloride upsets aquatic environments and can kill birds and some plants. Many people use more salt than they need. But using more salt does not melt more ice, or melt it faster. In reality, salt only works when there is enough snow or ice for it to react with and excess crystals will eventually become a pollutant. It's best to use less than four pounds of salt per 1,000 square feet. One pound of salt fills up a 12-ounce coffee mug. Green roofs are flat roofs planted with tolerant plant species that absorb, filter and store rain and snowmelt. While typically found on office or commercial buildings, green roofs can be installed on residential homes and garages. Because they provide an added layer of insulation, they offer the additional benefit of decreasing energy bills during the winters and summers. Green roofs, such as the one atop the Phillips Eco-Enterprise Center in Minneapolis, also are great places for employees to take a break and enjoy nature in an urban setting. Pathogens are disease-causing organisms including bacteria, viruses or protozoa that can cause illness. Minnehaha Creek is an urban stream that receives direct stormwater runoff from streets, which may contain pathogens that can cause illness. To reduce your exposure, we advise people to avoid direct body contact with Minnehaha Creek for 3 days after a rainfall. Body contact can include water in the mouth, eyes, ears or skin. The most common way to get sick is by getting water in the mouth during swimming, but it may be possible to get sick via exposure from canoeing, fishing or wading. To reduce exposure to pathogens, you should never drink creek water and should wash hands thoroughly with soap and water following contact with creek water. Elderly people, children and people with compromised immune systems are more susceptible to pathogens in surface water than others. Native plants are plants that have been in this region for hundreds of years and have evolved to withstand the local climate and ecological pressures. They naturally reduce polluted runoff. Porous (or pervious/permeable) pavements are surfaces that allow water to filter and flow through them, greatly decreasing problems associated with runoff. It is becoming more popular in construction practices. Porous asphalt and concrete are specially engineered to have extra spaces (pores) that allow water to trickle down to a storage area (a sand and gravel sub-base) beneath the surface that filters out pollutants. Porous pavers (bricks) are placed in such a manner that water flows into the crevices and filters into a storage area below. Porous pavement can be used almost anywhere, from large parking lots to residential streets and driveways.